Draupadi with her five husbands. In social anthropology and biology, polyandry (Greek: poly many, andros man) is the situation of a female forming a stable sexual union with more than one male. Polyandry is the specific form of polygamy in which a woman is married to more than one husband simultaneously. On the other hand, polygyny is when a man has multiple wives, which is the more common form of polygamy. The form of polyandry in which two (or more) brothers marry the same woman is known as "fraternal polyandry," and is the most frequently encountered form. Human polyandry is extremely rare, being found in very few societies historically. It is probable that such occurrences were in response to particular circumstances, such as lack of marriageable women in a society or the need for multiple fathers to assist in the work of feeding and protecting the children, rather than a societal norm. Under more normal conditions, there are sufficient women for all the men in a society to have their own spouse. In sociobiology, polyandry refers to a mating system in which one female forms more or less permanent bonds to more than one male. It is the converse of polygyny in which a single male mates with many females. Polyandry in nature can take two different forms. In one, typified by the Northern Jacana and some other ground-living birds, the female takes on much the same role traditionally seen in the male in a polygynous species. She holds a large territory within which several males build nests, lays eggs in all the nests, and plays little part in parental care. In the other form, typified by the Galápagos Hawk, a group of two or more males (which may or may not be related) and one female collectively care for a single nest. Polyandry with shared parental care is more likely in very difficult environments, where the efforts of more than two parents are needed to give a reasonable chance of rearing young successfully. Polyandry occurs in some primates, such as marmosets, other mammal groups, for example the marsupial mouse species antecchinus, some bird species, such as superb fairy wrens, and insects such as the field cricket gryllus bimaculatus of the invertebrate order orthoptera (containing crickets, grasshoppers, and groundhoppers). Females in this species will mate with any male close to them, including siblings. 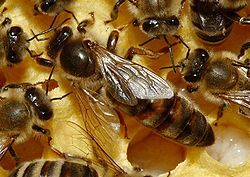 The queen bee is usually the only female bee within a hive reproducing with drones, which often come from various hives. She mothers most or all offspring within a given hive. Honeybees are said to be polyandrous because a queen typically mates with multiple males, even though mating is the only interaction that they have. The males subsequently die, and the queen stores the sperm to fertilize her eggs. The female domestic housecat exhibits a similar pattern of behavior, mating with multiple males, with her eggs fertilized by multiple partners in any one litter. The males often have nothing more to do with their mate afterwards, and are not involved in the care of the newborn. Polyandry appears to be the dominant social structure in a subfamily of New World monkeys called callitrichids, which include tamarins, marmosets, and other monkeys. They often live in groups that may contain more than one female, with the dominant female suppressing ovulation in subordinates, causing her to be the only one capable of reproduction. A Callimico female regularly births more than one offspring, and her eggs are separately fertilized by more than one male. Paternal investment is high in Callimicos, and males often carry infants on their backs, even when they are not the father. It has been suggested that multiple male mates are related, and therefore cooperation in caring for each other's young is adaptive. However, researchers that tagged and tracked Callimicos over time noticed that unrelated males migrated to new groups to cooperate with non-relatives as well as with relatives to care for young. It has also been suggested that females select cooperative males, and that the multiple offspring of Callimicos require paternal care for survival. Generally, however, polyandry in primates and other mammals is very rare and usually correlated with reduced or reverse sexual dimorphism. When males of a species are much larger than females, polygyny is usually practiced. As size difference decreases, or the females are larger than males, a species is more likely to practice monogamy or polyandry. The non-human great apes (gorillas, orangutans, and chimpanzees) are highly dimorphic and practice polygyny. Male and female gibbons (lesser apes) are similar in size and form monogamous pairs. Human men and women are less dimorphic in body size than the polygynous great apes, and are usually monogamous, although a significant amount of polygyny has been observed (Murdock 1981). Polyandry is the least frequent system of marriage, or stable sexual relationships, within human society. George Peter Murdock’s World Ethnographic Sample (Coult 1965) recorded only four societies where polyandry is practiced, less than one percent of the total number of societies in the world. Most commonly practiced between brothers, it is called fraternal polyandry. If the men are not related, it is non-fraternal polyandry. Islam bans polyandry completely. A woman may not have more than one husband. However, polygyny is allowed for men, permitting marriage to as many as four wives as long as they are able take care of them and love them equally. Both Judaism and Christianity prohibit polyandry, although polygamy known as "plural marriage," primarily polygny but sometimes polyandry, was practiced to a limited degree in early Mormonism. There is at least one reference to polyandry in the Hindu epic, Mahabharata. 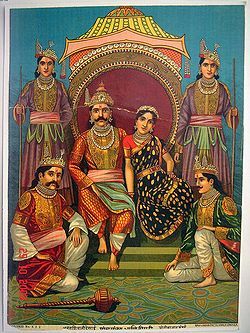 Draupadi marries the five Pandava brothers. This ancient text remains largely neutral to the general concept of polyandry, however, merely accepting this as her way of life. In the rare instances where polyandry has been observed by anthropologists, it seems to be more driven by local unique concerns than religious beliefs. In Tibet, which is the most well-documented cultural domain within which polyandry is practiced, the Toda practiced fraternal polyandry. There is no distinction in paternity with all children being treated the same. Toda say this limits the number of children in a harsh area, and helps to avoid disputes over inheritance of property. The Toda are also known to have practiced female infanticide, limiting the number of available females. However, the testimony of certain polyandrists themselves is that this marriage form is difficult to sustain. In Tibet, polyandry has been outlawed, and it is extremely rare to see them replicate polyandrous relationships in the refugee camps in India where many fled after the Chinese took over Tibet in 1950. Perhaps the next best documented society that had polyandry was the Sinhalese in Sri Lanka. They euphemistically referred to the practice as eka-ge-kema or "eating in one house." The practice is no longer legal, although it is possible that it may still survive in some remote areas. It did not occur in the Aryan tribes in the Vedic age, but only among the non-Aryan or Pandavas. The earliest documentation is of a queen of the region in the fourteenth century, where we find her calling herself the chief consort of the two brother kings named Perakumba. Every aspect that is recorded is remarkably similar to the better known Tibetan form of polyandry. These people are related to tribes in the area inhabited by the Toda, and they are documented as having arrived from the north, so it is possible that the practice was brought from there. Among anthropologists, polyandry is a controversial subject. It is extremely rare, and so it is very hard to be studied and understood with any statistical reliability. In many parts of the world, most traditional societies have been drastically altered or destroyed, and so the incidence of polyandry in the past may not be accurately known. Studies (Beckerman and Valentine 2002) have revealed that at least 20 Amazonian tribal societies accept that a child could, and ideally should, have more than one father. Members of these societies believe that all men who had a sexual relationship with a woman during her pregnancy contributed to the formation of her baby. This concept of "partible paternity" ensures that each child will be born with several fathers to take responsibility for the child, increasing their chances of survival. Prince Peter of Greece (1963), who studied information on the polyandry of the Kandyan Sinhalese, the Kerala Tiyyans, and the Tibetans, concluded that there existed a greater unity and solidarity of sibling groups among those practicing fraternal polyandry. He also emphasized the economic function of polyandry which intensified this unity and solidarity. In retrospect, it must be considered that these situations represent very unique situations, and these benefits are marginal at best. The potential harm seems much greater, as disputes over paternity and social disorder are some of the strongest arguments modern society has brought to bear on the issue. Hussein, Asiff. 'Eka-ge-kema':Fraternal polyandry among the olden-day Sinhalese WWW Virtual Library - Sri Lanka. Retrieved December 15, 2007. Why does Islam not Allow Polyandry? Retrieved December 15, 2007. This page was last modified on 29 November 2012, at 23:48.